This past weekend I ventured to Michigan to visit a friend I hadn’t seen in almost 2 years. 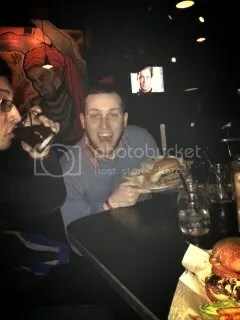 Joey was actually with me when I discovered my love for burgers in Colorado. We spent the weekend traveling around West Michigan touring breweries and enjoying the company of friends. Joey has been telling me for a while now that I have to go to Stella’s Lounge in Grand Rapids. 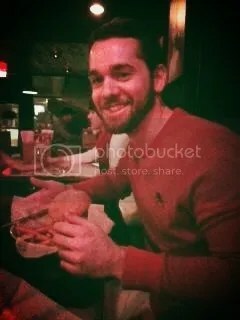 GQ Magazine named Stella’s Lounge the “Best Burger in America” in 2012. With a proclamation like that, I had to try it for myself. Stella’s is located in downtown Grand Rapids and is easy to miss. It’s located in an alleyway, and honestly looks a little sketch-tacular from the outside. This place definitely has a bar ambiance. It’s not huge, dark interior, and even has a small arcade at the front of the bar. Stella’s is known for their whiskey selection- they have over 200 to choose from on their menu. We were greeted shortly after being seated by our waiter who I could instantly tell was from the North. Being a yankee myself, I dont mean this as an insult. He was just direct and spoke what was on his mind. He was quick to take our drink orders, but after that disappeared for a while before returning to take our order. When we finally did get to order, I ordered their top selling burger- The Stella Blue. All of their burgers are made from 100% black Angus Beef from farms in Indiana and Ohio, and are stuffed with delicious goodness. 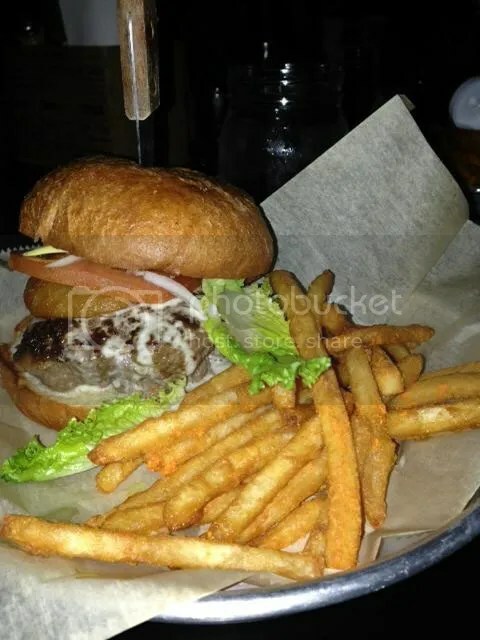 The Stella Blue is stuffed with bleu cheese and bacon, and then topped with lettuce, tomato, onion, sliced pickles, and an onion ring- all on a brioche bun. This burger was not only huge, but delicious! I have decided that I am a fan of stuffed burgers. It allows for the patty to have so much more flavor. I was worried the bacon and bleu cheese might be overwhelming when mixed together and stuffed in the burger, but it wasn’t. In fact, I felt like it was a perfect balance and the flavors mixed together well. To me, the bacon added a subtle and unique BBQ taste to the patty. My only complaint is that the burger:bun ratio was off. There was just too much patty and not enough bun. I have to mention the “Chronic Fries” that were served as a side. They were perfectly crisped fries, topped with a “secret spicy seasoning” that tasted like jalapenos. They were amazing! The spice was subtle and hit you up front. I would go back just for those fries! I can’t give Stella’s the title of “Best Burger in America”, but it does make my top 5 favorite burger list. 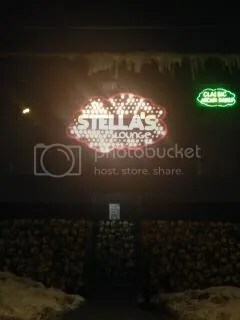 If you are ever in Grand Rapids I recommend giving Stella’s a try! Shout out to these guys for joining me on my burger adventure! The bun is there to hold everything together, and when the ratio is off everything just falls apart. Ha! No way could you finish that! I’m so full just thinking about it.